A timely and uniquely compelling plea for the importance of nurture in the ongoing nature-nurture debate. 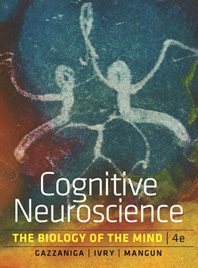 The most authoritative cognitive neuroscience text is also the most accessible. The first textbook for the course, and still the market leader, Cognitive Neuroscience has been thoroughly refreshed, rethought, and reorganized to enhance students’ and instructors’ experience. A stunning, all new art program conveys data and concepts clearly, and new chapter-opening Anatomical Orientation figures help students get their bearings. The table of contents and the chapters themselves have been reorganized to improve the logical flow of the narrative, and the world renowned author team has kept the book fully up to date on the latest research in this fast moving field. Cognitive Neuroscience has been revised to help students identify the most important material in the course. The Fourth Edition features a streamlined presentation, a new interior design, careful revision of each chapter’s heading and sub-heading structure, and a clear view of each chapter’s take-home messages. The stunning, all new art program was designed to facilitate student understanding, and includes a new “hand-pointer” feature that draws students’ attention to the most important figure elements. New chapter-opening Anatomical Orientation figures highlight the brain features that are most heavily discussed, giving students an easy reference for complex material. Each chapter leads off with a fascinating patient study designed to engage students right away, while conveying a larger concept. These studies discuss neurological disorders such as Parkinson’s and Alzheimer’s diseases in more detail. The revised Cognitive Neuroscience Patient Interviews DVD presents original footage of interviews with patients suffering from a variety of cognitive and neurological disorders. These interviews, conducted by psychologists and cognitive neuroscientists, allow students to witness firsthand the symptoms and empirical evidence of some of the most important and widely studied disorders in cognitive neuroscience. Several new videos have been added to the collection. The Studying the Mind DVD includes exclusive Norton interviews with leading cognitive neuroscience researchers. The individuals featured on the DVD discuss how the latest research and uses of technology, combined with an interdisciplinary approach to the field and cutting-edge conceptual models, have led to advances in our understanding of how the mind works. Featured researchers include Mark D’Esposito, Michael Gazzaniga, Marcia Johnson, Elizabeth Phelps, and John Gabrieli. This new chapter, unique among textbooks, emerges from Mike Gazzaniga’s current research, which he popularized in the recent trade book Who’s in Charge: Free Will and the Science of the Brain (2011). It integrates brain research into examination of the deeply personal issues of free will and justice, and is supported by new videos on the Patient Videos DVD.